It's cannabis-cultivating time again, and the San Luis Obispo County Sheriff's Department made its first big bust of the season when it helped to seize more than 61,000 marijuana plants in an illegal outdoor grow operation just east of Twitchell Reservoir on Highway 166. DEPARTMENT SEEING GREEN : Members of the San Luis Obispo and Santa Barbara County Sheriff's departments teamed up to bust a large marijuana-growing operation seen here from the air near the SLO County line. # A half-dozen SLO narcotics officers teamed up with the Santa Barbara County Sheriff's Department and eradicated the hefty hemp garden, which boasted an estimated street value of $195 million, on July 6. The scope makes this one of the biggest pot busts if not the biggest in the history of Santa Barbara County, said Sgt. Erik Raney, public information officer for Santa Barbara County Sheriff's Department. Officers in a Santa Barbara County Sheriff's helicopter flying on a routine patrol spotted the plants, growing in nine separate areas within a short distance from the riverbed and ranging in size from one foot to eight feet tall. Based on evidence deputies found at the camps near the farm, it appeared that the area has been used by Mexican nationals to grow marijuana for several seasons, Raney said. Marijuana farms run by Mexican drug cartels and Mexican nationals have become more prevalent since border security tightened after 9/11, according to Raney. "It's much easier to smuggle people into the country than truckloads of marijuana," he said. Raney explained that in the last few years, the Sheriff's Department has eradicated about a dozen marijuana farms per year. 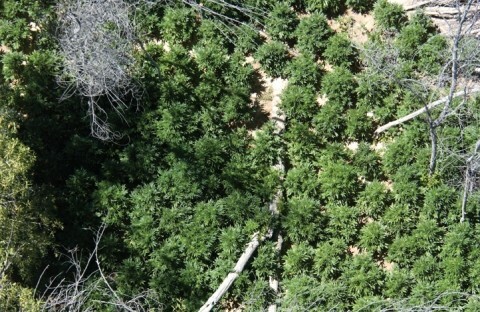 National forests including Los Padres National Forest have become a popular location for marijuana farms. According to statistics compiled by the U.S. Forest Service, nine out of the top 10 national forests for marijuana production are in California. In 2005, the Los Padres National Forest was number five on that list. Though this was the first big bust of the season, it likely won't be the last. "This is the start of what we call the primary growing season for marijuana," said Sgt. Brian Hascall of the SLO County Sheriff's Department. "It's when a majority of the marijuana is grown and harvested in the county. We have a large number of these operations we deal with each year, both South and North County." According to Hascall, marijuana season normally runs from July to late October or early November, and the gardens are typically found in areas that are very sparsely inhabited, such as in foothills and canyons. "Since we do have a lot of areas that meet those qualifications, we do find grows all over the county," Hascall said. Even though these illegal operations grow in the county, Hascall said that the local economy isn't really impacted. "We have found the grows are set up by criminal enterprises in Mexico," Hascall said. "The people are brought over the border to tend to the grows while the marijuana is harvested. The proceeds of the sale of the marijuana are shipped back to Mexico and used for the production of methamphetamine. Methamphetamines are produced in Mexico and shipped back over the border. It's definitely the drug of choice in California." Perhaps because of this theory, three reportedly undocumented Mexican nationals were arrested two days after the bust when they were found near Highway 166. Officers are investigating whether the suspects were involved with the marijuana garden. Whether the men are scapegoats for a high-rolling local drug lord, members of a Mexican drug cartel, or were just in the wrong place at the wrong time is yet to be determined. One thing for sure is that marijuana gardens are usually well protected as ammunition found at the grow site off of Highway 166 would indicate. Law enforcement officials have noticed an increase in violence associated with illegal gardens and warn hikers to be on the alert for armed guards and booby traps. Hascall said he was involved in a marijuana garden raid four years ago in Lopez Canyon, during which an armed subject fired a round at officers. He added that because of the excessively large amount of plants seized in the recent action, the Sheriff's Department is ruling out cultivation for medicinal marijuana as a possibility.